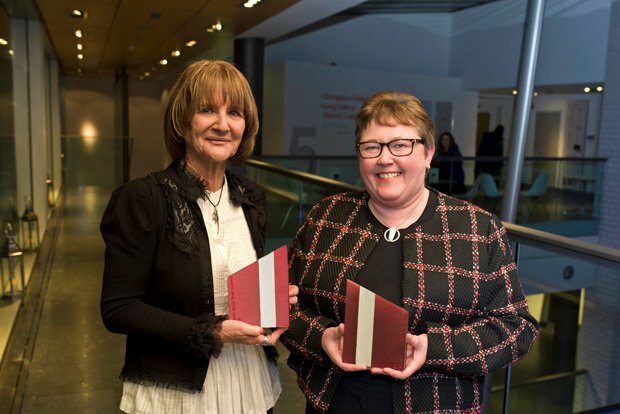 The Scottish Book Trust have announced the recipients of their 2019 Outstanding Achievement Award and Learning Professional Award, which will be awarded to children's author Theresa Breslin and Deena Wren, respectively. Breslin and Wren were fêted at the Lighthouse in Glasgow on 6 March, with guests including authors, teaching professionals, and representatives from publishing, libraries, the Scottish Government and BBC Scotland Learning. The Outstanding Achievement Award recognises an author or illustrator whose body of work meaningfully engages with their audience and the wider community. Over her 30 year career, Breslin has indeed demonstrated just that, with a bibliography of over 50 titles and spanning the genres of folklore, fantasy, historical and contemporary works. Inspired by her work with dyslexic readers and their parents as a librarian, she penned Whispers in the Graveyard in 1994 and was awarded the prestigious Carnegie Medal. Moreover, her young adult novel Divided City, which delves into issues of sectarianism and racism in Glasgow, was widely acclaimed and adapted into a musical play by the Citizens Theatre, as well as chosen for the One Book Community Reading Project, an Irish cross-border initiative funded by the EU Programme for Peace and Reconciliation. Outside of her writing career, Breslin is a passionate advocate for the importance of libraries in schools and the wider community, having coordinated the 2011 demonstration outside the Scottish Parliament to protest against the downgrading of library services. The Learning Professional Award was awarded to Wren, the librarian at Beeslack Community High School in Midlothian. With other ten years of experience under her belt, Wren was nominated by her colleagues for her extensive work in creating a library that is welcoming and accessible for all students. From the literacy programmes she has launched and the many author visits she organises, to the celebrations she throws for National Poetry Day, World Book Day, Harry Potter Day and more, Wren is much lauded for fostering a love of reading in both the pupils and staff at the school. Wren is also credited for her work with dyslexic readers and her support of the many clubs that take place in the library, as well as her work in promoting collaborative working across the curriculum so that literacy is regarded as a interdisciplinary issue across the entire school.